About the HPPC The Horse Park Polo Club is dedicated to introducing and training newcomers to the sport of polo, offering players of all levels the opportunity to improve their game and to enjoy the sport of polo in a relaxed and friendly atmosphere while encouraging good sportsmanship and safe play. 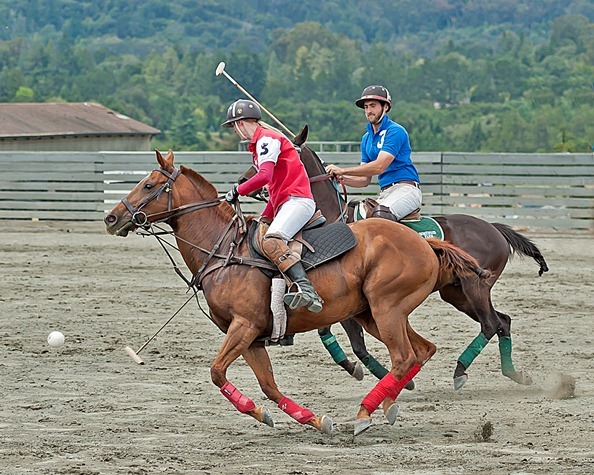 We are an arena polo club affiliated with the United States Polo Association with a regulation sized polo arena plus a hitting cage next to our arena. The summer season begins in early May and continues through the middle of September. Play will generally take place on Tuesday (4 pm till dark ) with club chukkers and on Wednesdays (4 pm till dark ) with group lessons for beginners and more experienced players. Horses and equipment are available for hire through our club Pro. There are also opportunities to play in the winter season, weather permitting, October to end of March, scheduled mid-day on Saturdays and Sundays. Please check our Calendar page for specific days. There is usually a potluck BBQ that takes place during the summer Tuesday evening program for players and friends. Spectators are always welcome to join us during any of our matches or practice games. For more information, visit the Club website.